It’s not often that I’ll read a book that I don’t know much about. I’m usually hooked by an intriguing synopsis, have already read something by the author, I’ve fallen for a pretty cover or, if it’s being reviewed everywhere, I want to know what everyone’s talking about. It wasn’t the case with Celeste Ng’s Little Fires Everywhere. 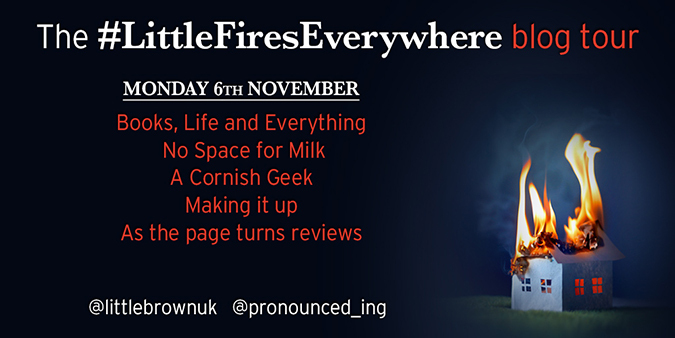 When the PR dropped into my inbox the first thing that got my attention was this quote from Jodi Picoult: “I read Little Fires Everywhere in a single, breathless sitting.” If my favourite writer was singing its praises I knew I had to read it. Especially as it had been so well received in America that they were bringing the UK release forward to capitalise on all the buzz. I learned with my ARCs of Jane Harper’s novels (The Dry and Force of Nature) that I bleddy love being one of the first to read a hyped new release. I’m a massive book nerd and love being able to recommend new titles ahead of their official publication – and this is definitely one that needs to be found in many a stocking on Christmas morning. 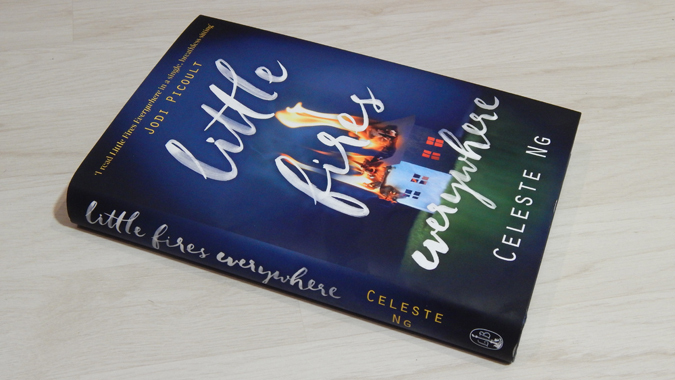 Little Fires Everywhere, in true Jodi Picoult fashion, centres on a court case that divides a community. An Asian baby is about to be adopted by a white family after being abandoned at a few months old. After having spent a year with her new parents, and with the paperwork about to be signed, her biological mother fights to get her back. But that’s not really what the book is about. It’s briefly touched on in the first few pages but then Ng goes on to spend a large portion of the book talking about two families who aren’t really involved in the court case. The lawyer husband on one side goes on to represent the adoptive family and the mother on the other side is a co-worker of the biological mother. Yet their decisions and division go on to change the lives of everyone involved. As I read the book without knowing much about the actual story, I found myself re-reading the blurb around the halfway point. I felt like not much had actually happened; Ng was simply setting the scene by letting us get to know the characters – the lawyer, the friend, their children and the journalist mother whose research uncovers a long-hidden secret. And the story is all the better for it because you really understand everyone’s motives and want what’s best for everyone – but not everyone can have a happy ending. I find it really exciting when a book can make me question what I think is morally right and what I’d do in a given situation and Little Fires Everywhere had me questioning myself almost at every chapter. I found Celeste Ng to be a really engaging writer and immersive storyteller and I’ll certainly be checking out her previous novel while I await the next. Next postI’ve finally found the perfect blog planner!